A long-standing tradition at Tet is the hanging of paintings to decorate the home. The “TIEN LOC” painting belongs to the duo-painting entitled “Tien Tai - Tien Loc” of Hang Trong folk painting (late 19th & early 20th centuries). On each of these paintings, a fairy child raises a vase with some words in Nom characters (ancient Vietnamese writing) on it. The painting “Tien tai” has the words “Fortune is as bountiful as water at the source”. The painting “Tien Loc” has the words “Luck is increasing”. 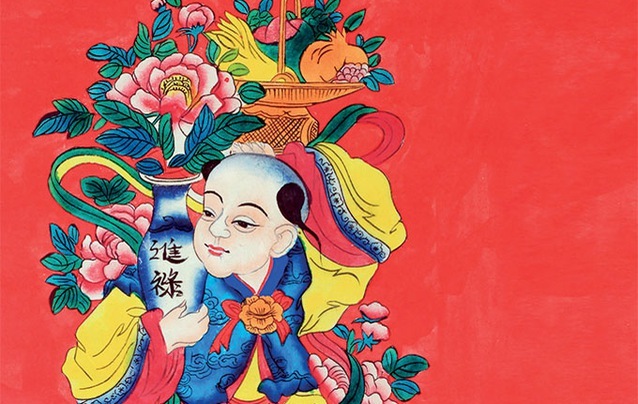 These paintings showcase Vietnamese wishes of always being supported by the gods. Similar to the Western custom of adorning the home with a Christmas tree and knick-knacks in red and green to celebrate the festive season and new year to come, Vietnamese decorate their homes with kumquat trees and “Tranh Tet”, a special range of paintings used only for Tet, during the lunar new year festive season. February 5 marks the beginning of unquestionably the most important holiday in Vietnam. Tet marks the end of the cold, harsh winter in the north and the beginning of spring. Similar to the Western new year, Tet also signifies new beginnings. Hanging Tet paintings around the home remains a key element of traditional Tet decorations, even as society in general undergoes a host of changes. Every spring, Tet paintings appear and add to the excitement as the new year approaches. After the day of “Ong Cong - Ong Tao”, or Kitchen God Day (falling on the 23rd day of the 12th lunar month), whether rich or poor, Vietnamese have continued the custom of shopping for a Tet painting. It is believed that removing the old painting from last year and hanging a new one helps to say farewell to the year passed and welcome in a more prosperous, luckier, and wealthier year to come. Folk paintings held the leading position in the lives of Vietnamese people before being replaced by modern artwork. 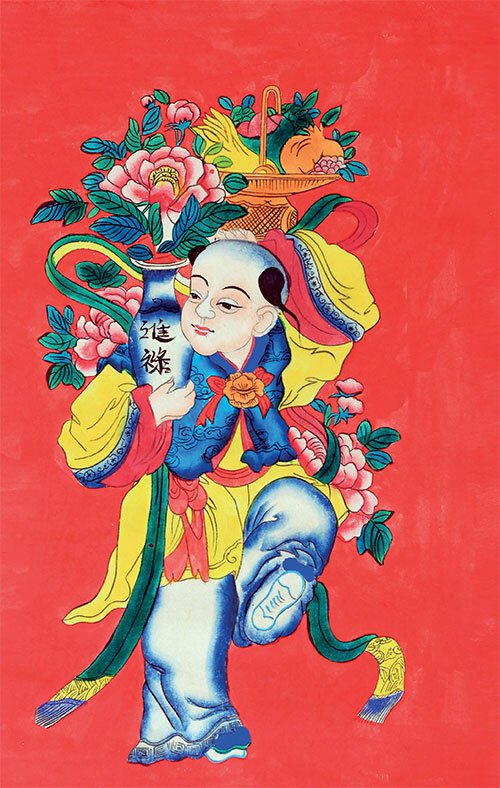 Tet folkloric paintings are quite diverse in terms of genre and contain messages of prosperity and luck. The Hang Trong, Dong Ho, and Kim Hoang folk painting lines are usually favored for Tet. In days gone by, homes in rural areas would be decorated with small, affordable paintings, while wealthier families in the city would hang more expensive versions. Hanging Tet paintings in the home was not only a custom but also a way to decorate the home, express wealth, and obey the traditional rules for the family. Outside the gate, people would post two paintings - one the God of Wealth and the other the God of Fortune - in the hope of receiving warm blessings. There were also families that posted paintings of the guardian gods as heavenly generals, to ward off demons and secure protection. In the home, people often hang or post paintings on popular topics during the Tet season, such as “Mother of the Chickens” and “Mother of the Pig Herd”, in the hope of a happy, harmonious, and prosperous year ahead. Every spring, Tet paintings appear and add to the excitement as the new year aproaches. The painting “Vinh hoa - Phu quy”, with a chubby little boy embracing a chicken or a duck, symbolizes happiness. The painting collection “To nu”, depicting four girls playing four different traditional musical instruments, showcases the beauty of the people. The painting “Tu quy”, with four different trees and flowers, expresses the desire for the four seasons - spring, summer, autumn, and winter - to be filled with joyful sounds. The “Ca chep vuot vu mon” painting, meanwhile, represents the desire among students to pass their exams, with a carp transformed into a dragon. 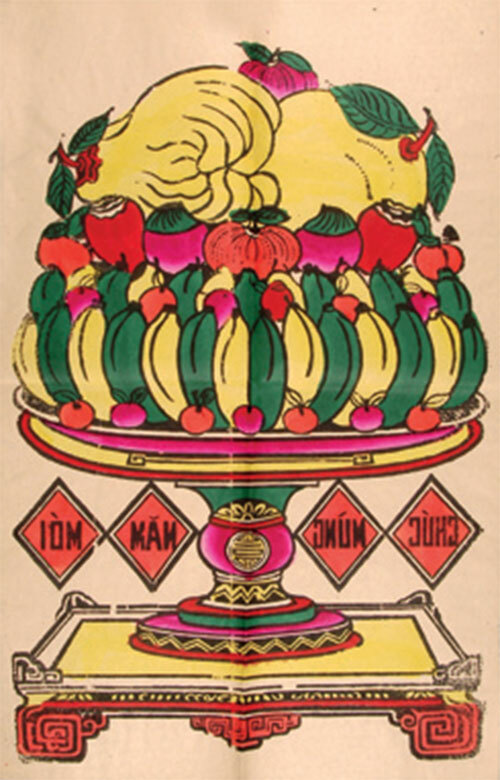 The “That dong” painting shows seven babies playing under a blooming peach tree, signifying the desire for a prosperous and happy life, while the “Tam da” symbolizes happiness, fortune, and longevity. The beginning of the new year is also the time for Vietnamese families to prepare their ancestors’ altars. A range of paintings bearing religious themes are sold on this occasion, such as those featuring the God of Wealth, the God of Fortune, the Mother Goddess, or the Four Goddesses (symbolizing Earth, Heaven, Forest and Water), while “Ngu qua” (five types of fruit) paintings are also chosen to replace the previous year’s painting. As well as Tet paintings with their cultural, historical and spiritual nuances, people also welcome in the new year with a picture of the zodiac animal. This year in the lunar calendar is the Year of the Pig, which according to folklore symbolizes prosperity, sexuality, and comfort. People also use the image of a golden-inlayed terracotta pig as a symbol of financial well-being. A pig’s head is also an important item as an offering at solemn ceremonies and rituals. In Eastern culture, pigs stood last among the 12 zodiac animals and also stood last in the six best home-range animals - Buffalo, Dog, Horse, Goat, Chicken, and Pig. The fertility of pigs is praised by ancient Vietnamese artists. 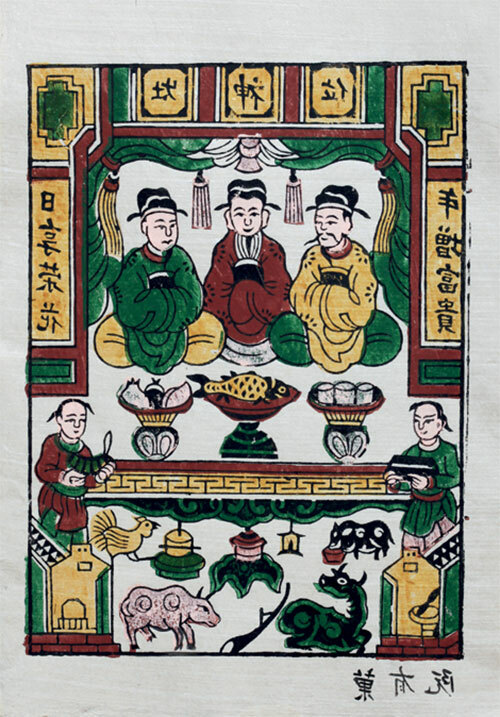 The Dong Ho folk painting called “Lon dan” is of a sow with its five piglets and a symbol of prosperity, health, and fertility. On the pig is a ring of Yin and Yang - meaning harmony of heaven and earth and all species growing and proliferating. Another painting, called “Lon an la ray”, depicts an old pig eating leaves. Dong Ho artisans finely drew the voracious pig sniffing the trough and the leaves appear to move. The wide mouth of the pig, which is tightly shut with a brunch of leaves hanging out, and its massive body slightly rearward in a strong and definite position expresses its health, determination, and balance. On the Kim Hoang folk painting of a pig for Tet, a black pig appears on bright red paper. A black block simulating the pig’s body is first printed on a red background, then the artist hand-draws details such as the eyes, the snout and the ears in white. The contrast of red, black and white is vivid and beautiful. The line of folk paintings from Sinh village in Hue also has works featuring pigs, but are for offerings only. The pigs are only painted in black, with shapes closely resembling actual pigs with no stylization. 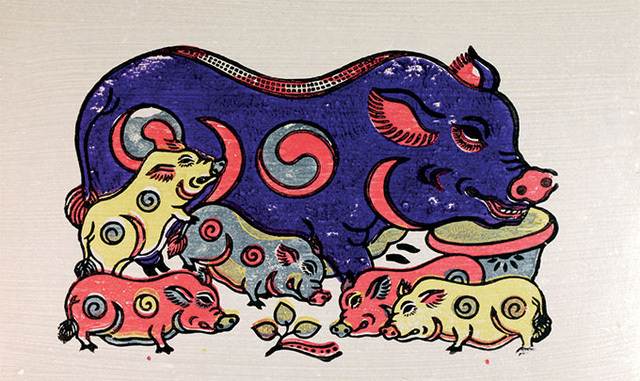 This type of pig painting is used as votive worship paper during the Tet season, bearing a wish that home-range animals remain fat and healthy. In short, the pig plays a very important role in cultivation and has always been respected in Vietnamese tradition, and paintings of pigs express a desire for prosperity among farmers. Fat pigs also represent hard work. Pigs are also linked to hope and are a beloved animal, with a famous proverb stating “Letting a pig be hungry for a day is like letting a person be hungry for half a year”. This may be the reason why ancient artisans chose pigs as their main topic and painted them with a great degree of love. The integration of Western culture in Vietnam has put pressure on traditional folk art, with many concerned about losing this line of Tet paintings and an elegant pastime of Vietnamese people. However, over the last few years, the practice of using folk paintings for home decoration during Tet has well and truly returned. Evidence of the resuscitation of this line of the artwork is the annual Tet painting exhibition held by a group of 20 artists in Hanoi. Over the last five years, in the month leading up to Tet, the “G39” group gathers to exhibit artworks focusing of the new year’s zodiac, promoting the hanging of Tet paintings in the home. “Maintaining the annual exhibition, the G39 group of artists not only honor the lunar new year but also bring art in general closer to the public,” said painter Le Thiet Cuong, who has promoted zodiac paintings in Hanoi since 2013. Seventy per cent of the paintings at last year’s exhibition, he said, sold out; a good sign for Tet paintings, the artists, and society.